Creating and calling functions is one of the most fundamental tasks in C++ programming. The function declaration serves as the primary description of a function’s interface – or contract – with callers, thereby making it the most important piece of code documentation. A good function declaration should convey as much information as possible. I’m sure an entire book could be written on the topic of function interface design, but I’ll just touch briefly on a few factors to consider when designing a function’s interface. Simple one-purpose functions should leave all or most error handling to the caller. This is more efficient because it eliminates error checking overhead on “known good” input values. A common pattern is a low level function that performs no input validation along with a high level function that does (and then calls the low level function to do the work). Such a design pattern gives the caller maximum flexibility. If the function must return error (or other status) values, it should do so via the return value whenever possible, and it should define an enum or type alias (typedef) so that the return value type name makes it clear that the value is a status. Note that using the return value as a status may necessitate extra arguments passed by reference so the function has a way to return a result to the caller without using the return value. Likewise, arguments that must never be negative should always be declared as an unsigned type. Incoming arguments that will not be modified should be declared const. This conveys a clear guarantee that the function will not try to modify the incoming value. Proper const delarations also give the optimizing compiler more ways to optimize the code. Now the caller can pass a string literal or any other string (even an MFC CString), and be assured that the CountWords function won’t change it. 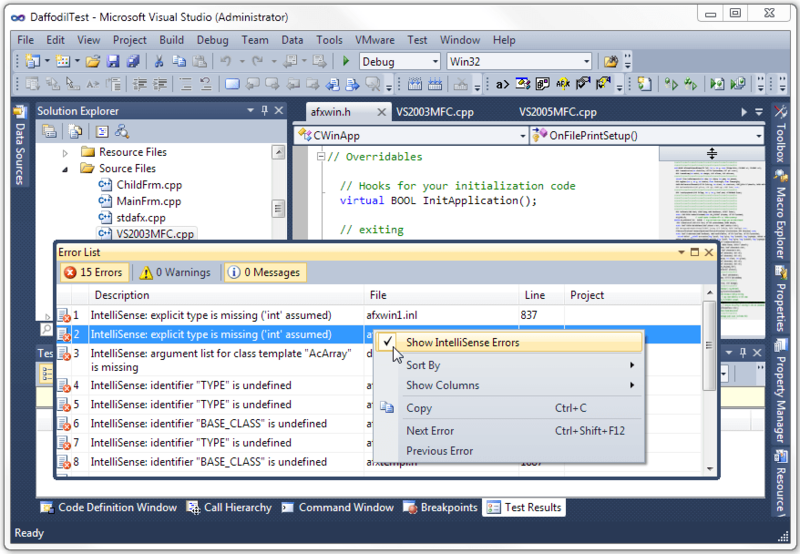 Source code annotation language (SAL) is a fairly recent Microsoft specific development. It consists of predefined macros that help more fully express the constraints and purposes of function arguments without changing the compiled output. SAL helps convey additional information about the function’s contract with the caller, and it also helps the compiler detect potential problems at compile time by performing additional static code analysis. As you can see below, source code annotation can get a bit messy. I rarely use source code annotation in my own code for this reason and also because it’s not portable to older versions of Visual Studio without extra work. Source code annotation is most appropriate in an API that will be consumed by others, and even then it should be considered carefully in light of its readability and portability trade-offs. In C++, the exception specification conveys information about what kinds of exceptions a function may throw, either directly or indirectly via functions it calls. If a function cannot throw an exception, you should include the empty throw() suffix on the function declaration. Let’s say you have an ObjectARX module with an implicit dependency on another DLL. 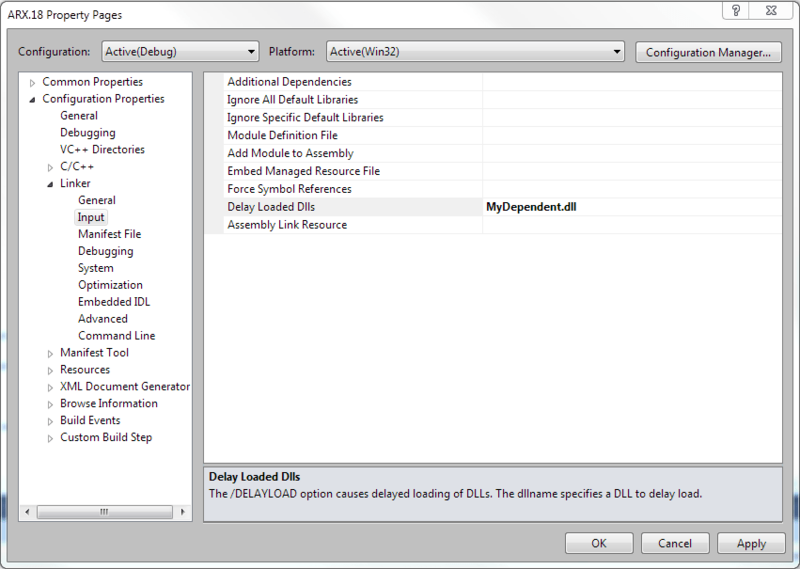 Your installer puts both your ARX module and the dependent DLL into a private application folder. Windows must be able to resolve the implicit DLL dependency at load time, otherwise it will fail to load your ARX module. Alas, Windows will not automatically search for the dependent DLL in your application folder, even though your ARX module is located there. Therefore your ARX module won’t load because the dependent DLL cannot be resolved. To address this problem, you may be tempted to add your application folder to the AutoCAD support path so that Windows can find your dependent DLL. This is a Very Bad Idea – please don’t ever do it! It imposes a completely unnecessary burden on end users, and it’s not scaleable because it could cause the maximum support path length to be exceeded. A better solution is to change the implicit dependency into an explicit dependency by using the linker’s delayload feature. When you use this technique, you do have to ensure that the delayload hook is added before any function in the dependent DLL is called. This is not a problem in most cases, but it could be a consideration if your ARX module initializes global objects whose constructors must call functions in the dependent DLL. This is just one more reason why you should avoid global variables.